UPDATE: This research project has been updated for 2018, with new data and analysis. Every year, we ask 1000+ bloggers how they approach the job of creating content. The questions are simple, but the answers tell the story about a changing industry. The business of content is evolving. The effort we put into our content is changing, and so is the content we create. The pace of that change is accelerating. The purpose of this research is to track those changes. But first, THANK YOU to all of the 1055 bloggers who completed the survey, and to the experts who added their insights below. This would have been an impossible task without you. 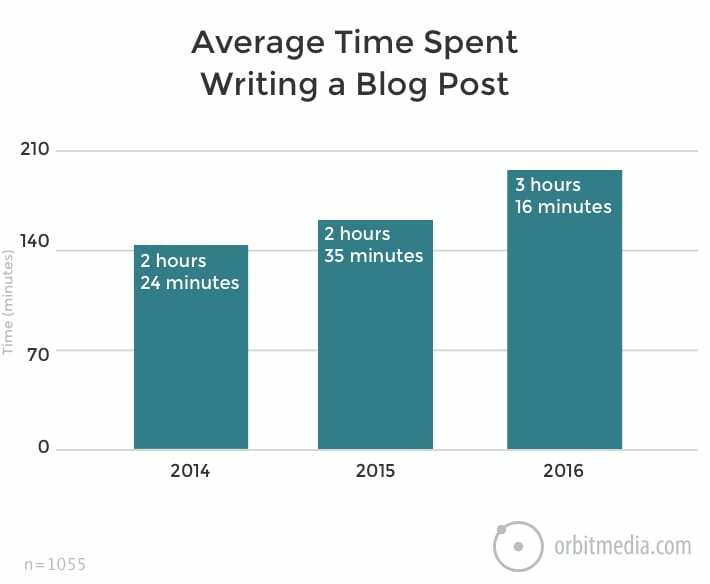 The average blog post takes 3 hours 16 minutes to write. That’s a 26% increase from last year. Twice as many bloggers are now spending 6+ hours on their average post. 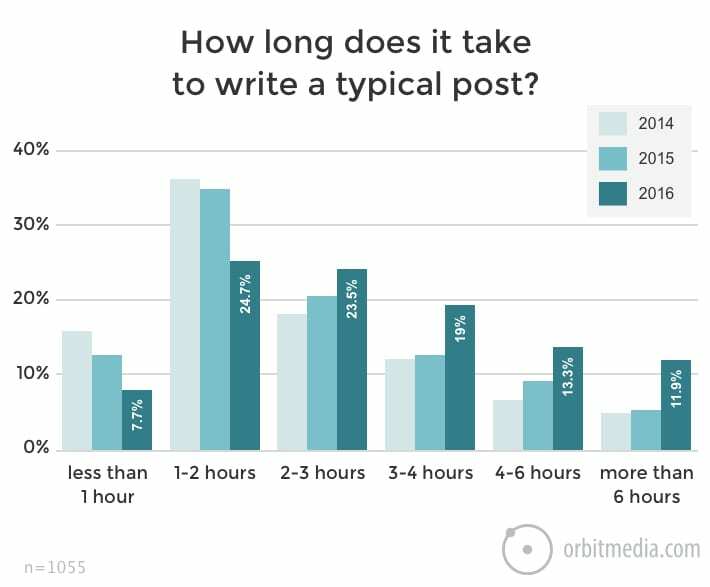 Last year, half of all bloggers spent less than two hours on a typical post. This year it’s down to one third. Analysis: Do bloggers who spend more time get better results? This year’s survey asked bloggers to report the results of their blogging efforts on a scale: The blog delivers strong results, some results, disappointing results and “I don’t know.” This allowed us to find relationships between blogging trends and results. This is evidence that the extra effort is worth it. “Andy asked me for a comment about this, and my comment is less of a comment than it is a HALLELUJAH and hearty slaps of HIGH-FIVES! In FULL-ON SHOUTY CAPS! Marketing’s compass arrow has been pointing relentlessly toward quality content for quite a while now. And my interpretation of this data is that content creators have finally bought some decent hiking boots, layered up, and charged down the path. The data points that I consider most gratifying are three: Time spent writing and length of post (both of which are up); and frequency of publishing (which is down). Here we find more evidence that we are putting more effort into our content. Blogging may have started as an informal way to write for the web – and we saw that in early data – but bloggers are getting serious. More of us are working with editors. 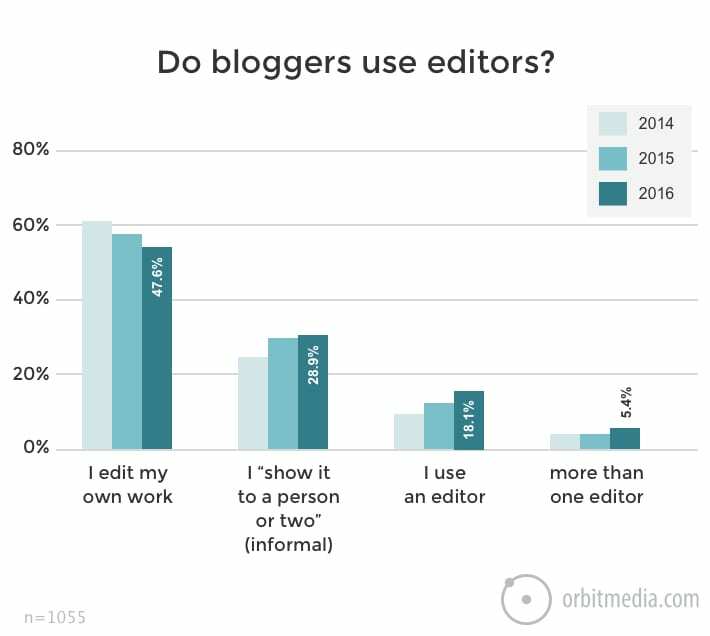 About 1 in 4 bloggers have a formal process for editing. The percentage of bloggers who have multiple editors in their content workflow has doubled in the last year. In the past, we found that most bloggers edited their own work. Now that number has dipped below 50%. Most bloggers get a second set of eyes on a typical post. Analysis: Do bloggers who use editors get better results? We looked for a connection between the use of editors and blogging outcomes. There is a relationship. “As content marketing continues to ‘grow up’ and to become both more strategic and more professional, it just makes sense to have an editor on the team if you have the budget. Our full-time Editor-in-Chief, Stefanie Flaxman, makes sure that our content is well-written and that the hyphens are where they’re supposed to be. Our second major finding is in the content itself. All that extra time we’re putting into our content translates into longer, more media rich content. This might be the biggest finding of the survey. Shorties are on the decline: the percentage of posts that are 500 words or less is half what is was two years ago. Big posts are on the rise: the percentage of posts that are 2000+ words long has doubled every year. Analysis: Do bloggers who write longer posts get better results? 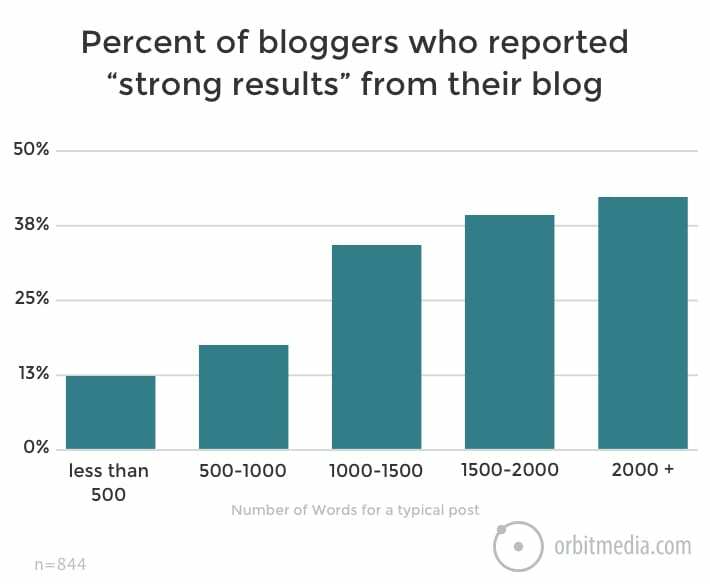 Here we find a direct correlation between length of post and self-reported “strong results.” Those bloggers who write very short articles were especially unlikely to meet their own expectations. “What concerns me about this data is how some people will take it. Length is not the point. But length can be an indication of quality – for example, Brian Dean’s ‘skyscraper’ posts are often very long, and there length happens to match quality. But others try to fill their blog with ‘long posts’ like roundup posts… which nobody cares to read and which only get shared by a handful of the folks included in the roundup. Importantly, the trend is not just toward longer content but more satisfying, less bubble-gummy posts. Not only are top bloggers publishing meatier posts but they’re also publishing less frequently. (Unbounce recently took a li’l break from blogging.) Blogs that try to maintain aggressive publishing schedules while also pushing for meatier, more “epic” content are only going to fatigue their writers. What media are bloggers including in their content? Beyond words, the use of visuals and formatting are on the rise. When asked what goes into our content, we find all kinds of things in the mix, and an uptick in the use of visual content over the last few years. Bloggers who selected “other” were asked to specify. Responses included Slideshare, quotes from experts (one of my favorite additions), calls to action, stories, questions, links (another good one), statistics, recipes and swear words. 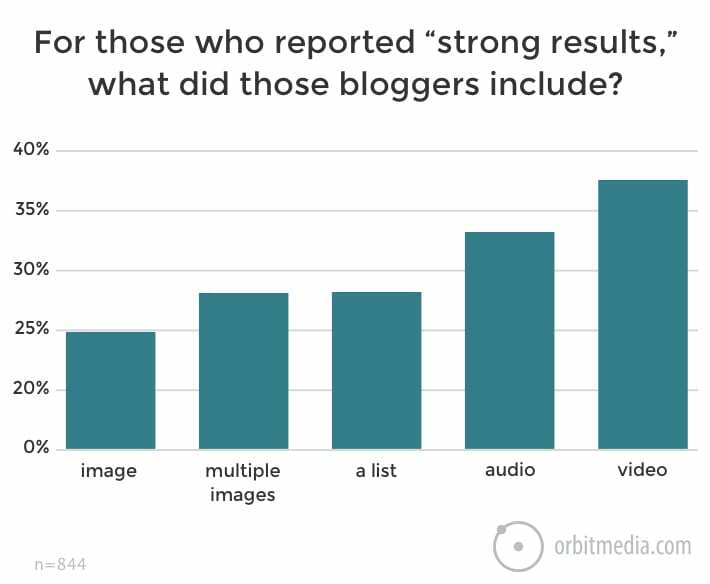 Analysis: Do bloggers who add more visual content get better results? We sorted this list by effectiveness, which puts video at the top of the list. Video is the most time consuming item on the list. So here again, there’s a relationship between investment and returns. Note: We only found 21 bloggers who put audio content into a typical post. Of those, seven reported strong results. We are looking at a very small dataset here. “I have two conclusions from this year’s data. First, it does appear as if the standard ‘blog post’ is more in-depth, infrequent, and multi-media than ever. #3. 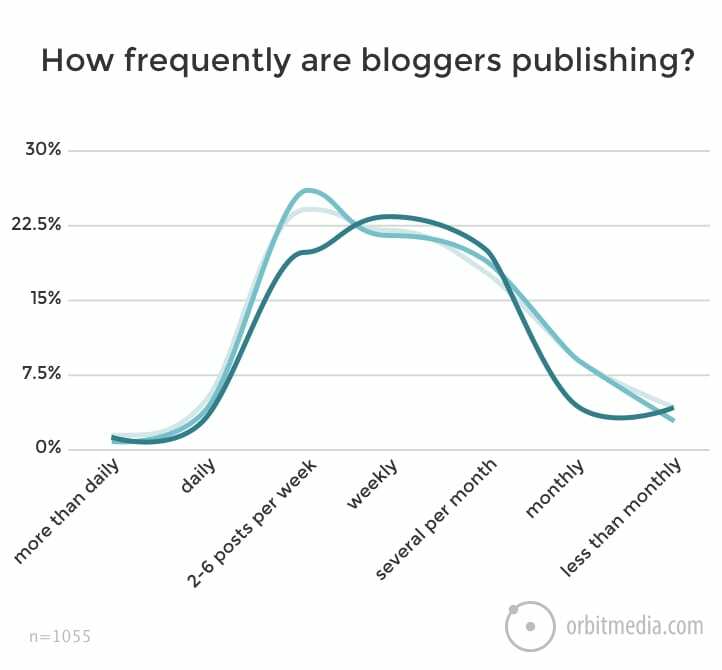 Blogging frequency dips, as fewer bloggers publish daily. How frequently are bloggers publishing? Daily is down: The percentage of visitors who are blogging daily is down by more than 50%. Weekly is up: Weekly is now the most common answer to the question of frequency. Monthly is up a lot: We found a 38% rise in the percentage of bloggers who publish monthly. 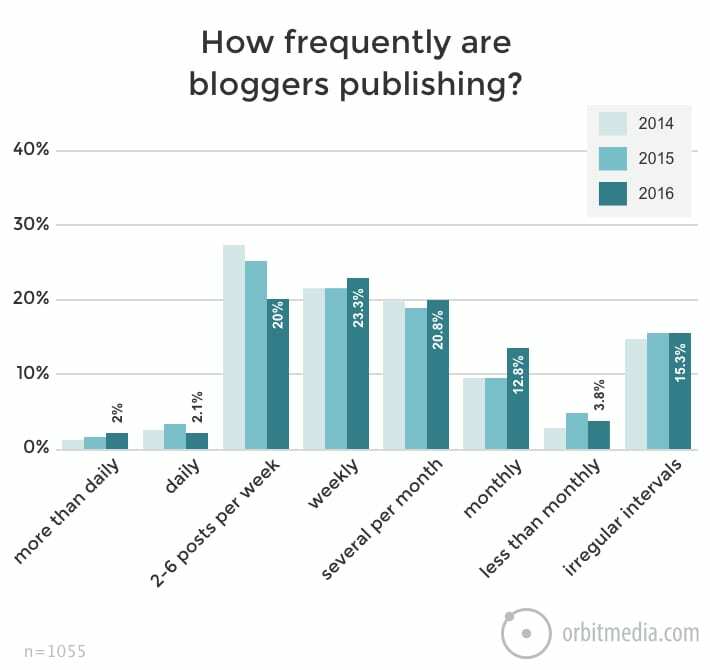 Analysis: Do bloggers who publish less frequently get better results? As the investment of time and energy in each post goes up, frequency is edging down. Not surprising since resources are finite. In the quality versus quantity debate, quality is winning as the more popular strategy. But does less frequent mean better results? No. 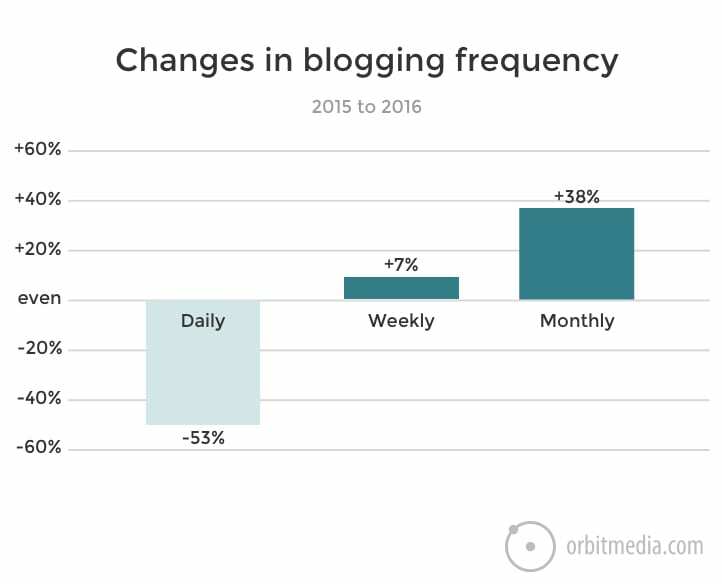 Bloggers with higher-frequency content programs are probably doing other things well, including distribution, promotion and measurement. “We’ve seen the trend toward less digital content for the past few years…and it looks like this research shows exactly that. Bloggers are moving from daily and multi-week to weekly and monthly. Although it’s hard to tell, I’m hopeful that these bloggers are focusing on less ‘truly exceptional’ pieces of content instead of many ‘good pieces. #4. Content promotion: Email and paid are up. SEO is flat. Social is critical: Virtually all bloggers (more than 95%) are promoting their blog posts on social media. Most bloggers are SEO-savvy: More than half of respondents (57%) are using search engine optimization to promote their content. But this number is mostly flat. Email is becoming more important: We see a 60% increase in number of bloggers using email over the last two years. 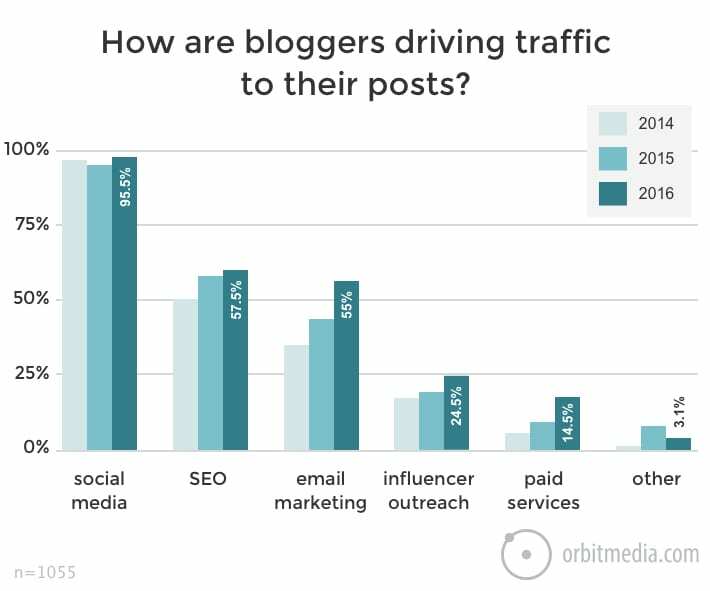 The majority of surveyed bloggers are now using email to promote their content. More bloggers are buying traffic: Although only 14% of bloggers are paying for visitors, this number is up more than 3x over the last two years. Some content promotion tactics are up. Others are flat. Nothing is down. Looks like bloggers are focused on traffic more than before. Promoting on social media is easy. It’s as simple as clicking a button, so of course it’s ubiquitous. But the other promotion channels show big distinctions. The use of search optimization is flat. It seems there are two kinds of bloggers: those that use SEO and those that do not. Most bloggers are now using email marketing. Collaboration is on the rise, as more bloggers seek to borrow the audience of influencers. Paid is up. Considering the rising revenues at Facebook and Google, combined with the continuing trend in native ads, this isn’t surprising. Analysis: Bloggers who use which promotion channels are getting the best results? 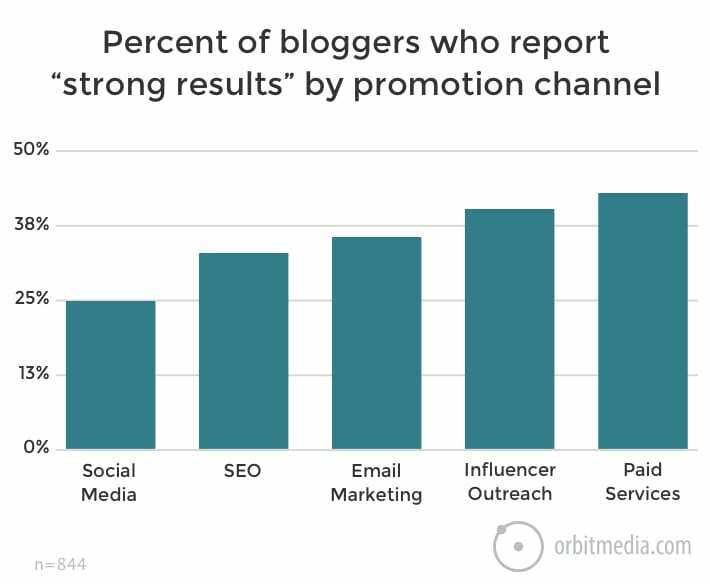 Let’s look at which promotion channels align with bloggers’ self-reporting of “strong results,” social media, search optimization, email marketing, influencer marketing or paid advertising. This chart shows an exact inverse of the tactics that are most popular. Bloggers who use the least popular promotion tactics are the most likely to report strong results. Perhaps they find less competition there. Or maybe it’s just that easier tactics are more popular, but rarely more effective. “Content marketing is in its prime, more popular than ever before. This is a good thing for content consumers, because it means brands are more focused on creating quality content than ever before. How often do you check your analytics? Analytics isn’t fully embraced yet: Nearly 7 in 10 bloggers don’t always check content performance. 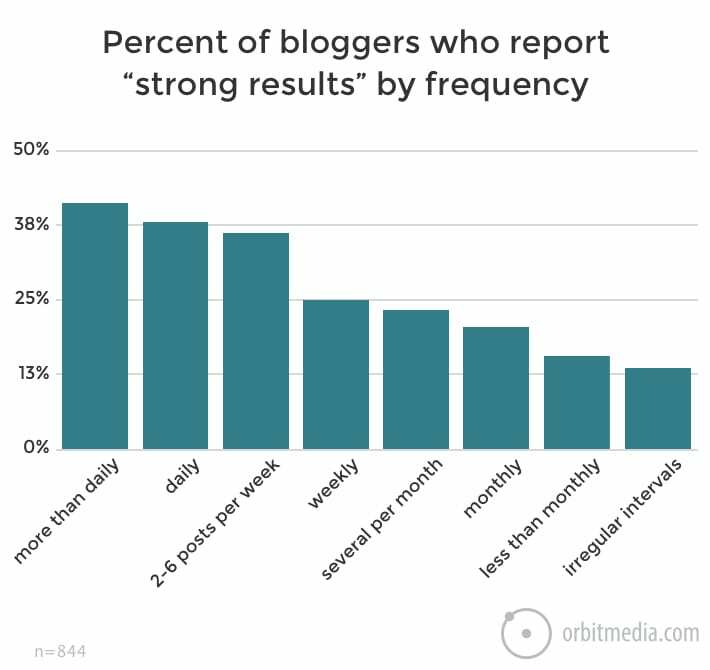 More bloggers are data-driven: A greater percentage of us are checking results every time. 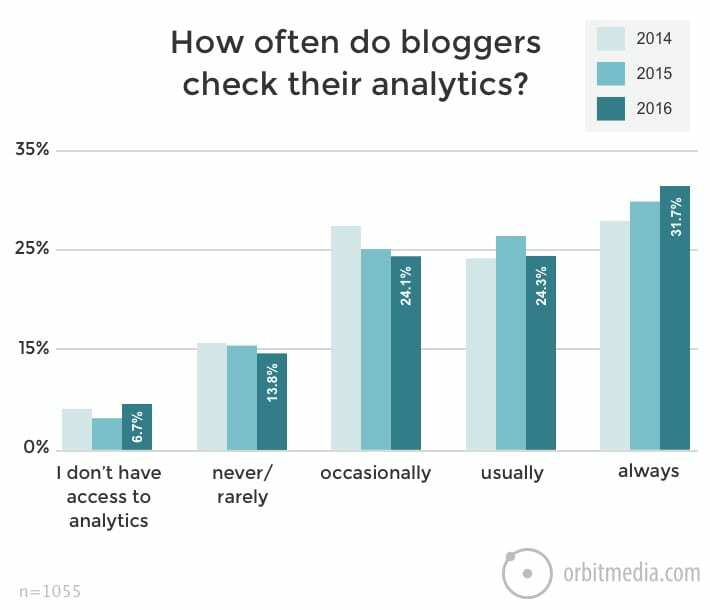 Over the last three years, there’s an 18% increase in bloggers who “always” check Analytics. Most bloggers do check Analytics: 56% of respondents “usually” or “always” check the results of a given post. That number hasn’t changed much over the last few years. Some bloggers don’t seem to care: 1 in 5 bloggers don’t even have access to Analytics or hardly ever look at results. Analysis: Do bloggers who use Analytics get better results? 30% of bloggers who regularly check Analytics (usually or always) report “strong results” from their blog. 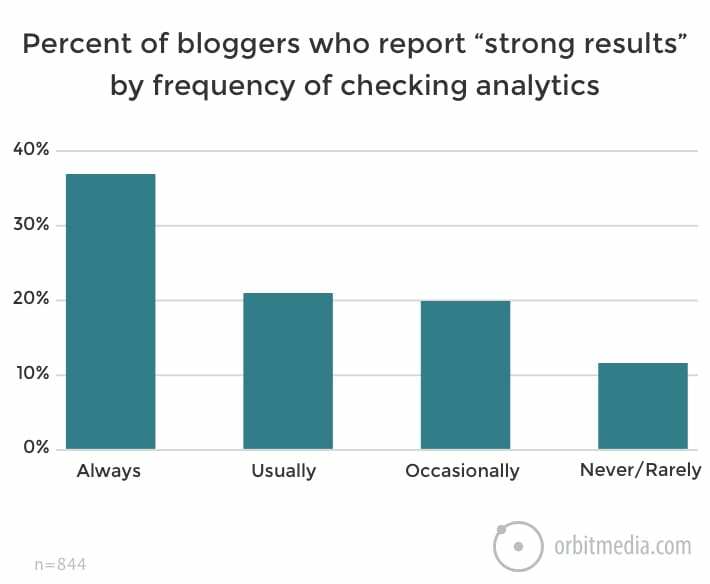 Only 18% of bloggers who don’t regularly check Analytics (rarely, occasionally, never or “don’t have access”) report “strong results” from their blog. 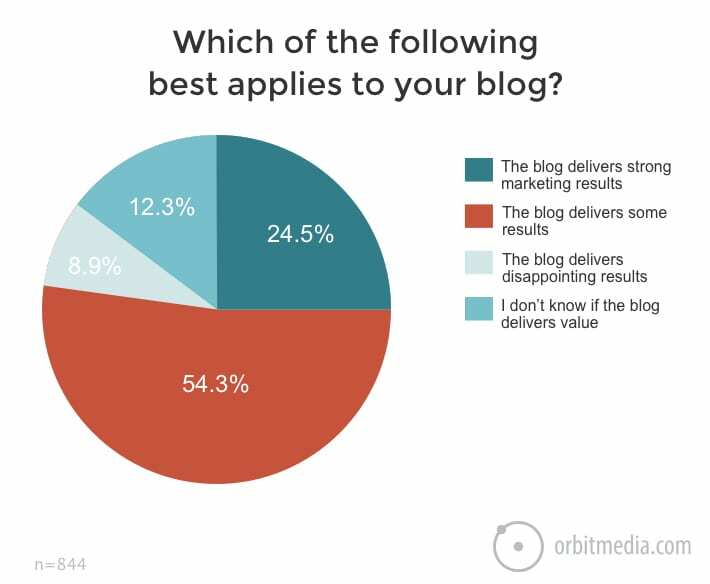 Bloggers who are consistent about measurement report better results. But bloggers have a long way to go. Analytics is one of the major differentiators. “I’m a baker. I have a sourdough bread starter that I began growing nearly two years ago. His name is Horace. I feed him weekly and everyone in my house knows Horace’s growth is sacred. Because of Horace, I can sometimes wing bread baking because he makes up for the lack of my ability to accurately measure things (I don’t really love leveling my measuring cups with a knife because I’m kind of lazy). But there are often recipes where Horace isn’t useful so I have to follow a recipe exactly. That’s the thing with baking: You can’t really wing it because it’s nearly an exact science. That’s how I feel about blogging. You can’t wing it without analytics to measure your efforts. Sure, you can get by and probably even have some success without a content starter like Horace (though you might name yours something else), but to actually generate revenue from your efforts, analytics will guide those efforts. The good news is that there is an increase in bloggers who always check their analytics, but nearly 70 percent don’t always check their data. This is akin to throwing together some yeast, flour, and water, mixing it all together, throwing it in a pan, and baking it…in the hopes that it becomes Parker House Rolls from The Little Nell in Aspen (trust me, they are divine). spends 1-3 hours writing 500-1000 words weekly and usually checks Analytics. spends 2-3 hours writing 500-1500 words several times per week and always checks Analytics. Let’s end with a pie chart. We haven’t used one of those yet. How are we doing? Are we getting results? What percentage of bloggers are getting results? Awesome stuff Andy! I’m glad to see that quality is trumping quantity. This is such an insightful post, and in my mind, the key theme has to do with investment. The more people are investing in their content – whether that’s through increased length, addition of video, or attention to analytics – the more value they are getting from that content. As someone who gets brought in to create high-value content, I’ve also seen this in action firsthand. For a long time, the majority of my clients were simply interested in hitting a schedule, but over this last year, I’ve had several clients really invest in doing it right, and they are achieving big time results: tripling views & shares, getting content on the front page for target keyphrases, and hitting 6 figure MRR. Blogging can be really powerful if you’re willing to go about it the right way. I loved the results! It proved me that writing quality content with long length its worth to put our efforts into – this is the strategy I follow when I blog, too. One question: how results were defined during this research? More visitors? More converts from visitors to newsletter subscribers / content downloads / trial requests; etc? …but we didn’t define “results” for the respondents. As I’m sure you know, marketers have many definitions for success. I imagine that people were thinking of many things as they answered this: brand awareness, list growth, social engagement, link attraction, traffic, leads and revenue. Thanks for asking. Maybe next year we’ll ask what success means to them! I second the motion to include a “This is how I define success” question for next year. I’ll just chime in that I had wondered the same thing as Timi. Not that there’s not already a TON of great stuff here, though!! Nice work by you and your team. Great analysis, Andy! Happy to see that working on long-form quality content seems to be the trend. That’s my focus in working with my clients. Andy, thanks for doing your surveys on blogging. They’re golden! Great blogs take time, focus and love. It shows when those ingredients go in, and when they don’t. Great post and valuable data. I bet it took more than 6 hours and one editor to put together…..
Keep up the research, we really appreciate it. Yes, this “blog post” takes 100+ hours to create. Five of us worked on it. Almost all of the respondents were from my LinkedIn connections. As I’ve connected with people for the last three years, I’ve scanned their profiles to see if A) They’ve published to the LinkedIn platform or B) They’d been endorsed for “blogging” or “content marketing.” So I suspect that 99% are business bloggers. Also, since I saw their content first hand or they’d been endorsed by others, it was a bit better than letting people self-identify. When I found these, I moved them to a list. The list now has about 1200 people on it, almost all of them are in the US (90% or more) and a good chunk are right here in the Chicago area (20% or so). A small number of respondents came from social media where we shared the survey. Almost everyone came from direct outreach from me. I sent around 1000 semi-personal requests through Ninja Outreach. There were nights when my hands ached. It’s a crazy amount of work to get this done. This was super-interesting, Andy, and I appreciated being a part of the survey! And I am impressed by your commitment to keeping the industry informed. Thank you. Very interesting and helpful research once again. It certainly appears blogging is evolving and becoming more professional, strategic and data driven. The increased time in developing posts and increasing use of editors does seem to indicate a stronger focus on quality. Committed blogging is not for the faint of heart, but it’s great to see that so many bloggers report seeing positive results from their efforts. Thanks for gathering the data and publishing this report! “more professional, strategic and data driven” …that’s a nice summary, Steve! Thanks Andy! It’s good to know that the things I’ve noticed casually are statistically accurate. There’s no substitute for measurable, quality content that addresses the needs of your audience. This research confirms that if brands can follow that simple formula, they can find success through blogging. Analysis is paralysis – what are we supposed to do with all of this information? We are in the 20 hour week blogging camp and we know our 4 year old birdie brunch branded weekly newsletter that pushes our most recent blog articles accounts for between 15% and 25% of our revenue. The 20 hours also includes the development/deployment of the actual mail chimp newsletter which is how we serve up our blog posts. That said, in spite of having more analytics dashboards than most bloggers I still see my main KPI as the number of Disqus and mail chimp comments for every post – I don’t care what my metrics indicate – if my content isn’t initiating discussions it has not resonated with anyone. I completely agree with Joanna – although length is good, it depends on the topic. When I was in high school, I was great at filler text to meet the required amount of words for an essay. We shouldn’t treat our blogs like high school English class. Make the content relevant and work to get as much good content into as you can. If there’s not much there (less than 500) then it’s probably time to reevaluate. The same would go for frequency – sometimes there just isn’t something interesting or relevant enough. I would say if you post no less than every other month (but do you best to post at least once a month), you’re readers will thank you for giving them information they want to read, not just because you’re trying to fit something into a strict schedule. If you want to stick to a strict schedule, break down your blog into Part 1, Part 2, and Part 3. Really great insights, thanks Andy! I’m wondering about where the 6+ hours goes. After 5 years of blogging I abandoned my blog after being one of those who was getting decent results, spending 6+ hours on longer blogposts. Most of those 6+ hours were spent screwing around with WordPress and not actually writing. I think this is really important because first-time bloggers don’t fully understand what they’re getting into, and they never get past writing 5 blogposts before they quit. It’d be nice to know how many bloggers are just bloggers, and how many also manage their own site. In those 2 groups, how much time is spent on the ideas and writing vs. time spend on tech stuff. It’s a great point, Oz. Even if it’s not a tech problem with WP, lot of “writing” time is actually spent tinkering with formatting. Even if you use Word, a lot of time goes into playing with text instead of putting words on the page. I know a blogger who recommends doing a first draft in Note Pad or some other text editor. If you take away all the tools, you might get the writing done faster! Totally agree it’s possible to spend a lot of time ‘tinkering’. I’ve taken to recording blog posts and getting them transcribed at Rev.com. Means I have a complete draft before I start editing! I wonder about the huge percentage who include a list. One of those self-fulfilling prophecies where web research reports ‘people read list posts’, so everyone promptly goes out and creates list posts. Interesting to see that the far smaller percentage who use audio are getting a much stronger result. Maybe I’ll start loading audio as well rather than just transcribing! Yep, that’s our approach at DivvyHQ… a simple text/html editor to use as a sandbox for the draft, and storage of visual assets that will be included. Once approved, the content can be transferred, formatted, optimized, etc… Great work on this survey and report Andy (and team)!!! Thanks for including me in your survey again this year. I always feel like an outsider in the blogging community and this is the one time a year I feel like a lot less of one. I think what people also need to consider is that the answers to a lot of these questions are niche driven. For example if we spent anywhere near 6 hours on each blog post we would be out of business in a hurry, also we don’t have set lengths we shoot for, the post is “as long as it sees to be”. As far as what “strong results” means, that’s all what it means to the individual. I used to think 20,000 visitors or 400,000 page views a day was strong results, now it is less than half of an average day. The whole idea is just find what works for you and keep pounding it until it doesn’t, and hopefully that day never comes. Thanks again Andy for the hard work, I always look forward to seeing what is working for other people and seeing if there is a way I can tie it into my little blog. I continue to be awe-struck, Andy, at both your tenacity in putting this together year after year, and you and your team’s incredible attention to detail in making sure that the study, and conclusions, are valid and informative. Bravo! I really appreciate the work you put into this post and the solid research that you did. I’m encouraged to see that bloggers are publishing less frequently, spending more time on each post, and writing longer posts (other than lists and round-ups). These findings are in line with my approach to my blog, so I feel good about the report. Thank you! Interesting that the 14% that use paid promotion — I’d imagine the bulk of that is social or PPC — report stronger results than any other channel. There’s no number on the graph but that looks like 40-42%. No doubt about it, the future of social media marketing is a path paved in payment. Awesome new Research of blogger in SEO.Great informative article.Thanks for sharing your this information and helpful article. This is the type of data bloggers need to see, but they need to be careful how they apply the analysis and comments. Yes, there are a lot of roundups that aren’t that compelling. And in trying to out-Skyscraper already long posts, I’m not sure people really want to embrace “192 experts share their tips”. But there are also exceptions. Two days ago, Mike Allton published Boost Your Income: 52 Influencers Reveal Their Best and Worst Monetization Secrets. It has 701 shares so far and many have commented they found especially the “worst” examples useful. Because he took the time to create images, that content will end up being reshared over the long haul. Regarding publishing frequency, it is really a challenge to publish daily while keeping quality up. But Google does seem to favor sites that publish almost daily, so serious sites should consider ways to encourage top writers to contribute regularly. Huge thanks for the post Andy. Your effort and data confirm that the antiquated view of content is rapidly vanishing in the rear view mirror. This is indeed an amazing share! The tactics different bloggers apply in creating their posts are really wonderful to know. The statistics about time they take to write the posts in different years are varying and that is an interesting point to note. I am sure the more one spend on a particular post to create will surely come out as an epic one, and at the same time however expert you are a post create in a hurry will have its own drawbacks. Nice survey to study and analyze. Many of us bloggers can pick a lot of tips from this posts. 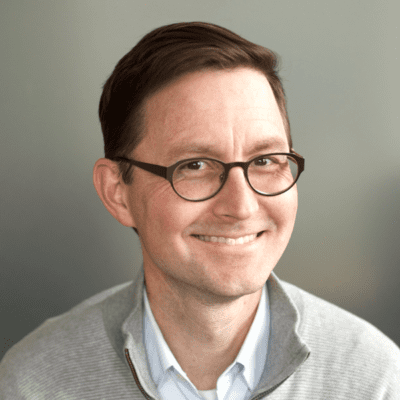 Thanks, Andy Crestodina for the pain you have taken to bring it out such an informative piece. I found this post today on the pages of Inbound org where Brian curated it and i up-voted it and shared the above comment. Time and frequency has been increased with time year by year……. Terrific post and super-relevant research. Bravo! I now expect TL:DR to be replaced by NLE:DR (Not Long Enough: Didn’t Read). You’re hilarious. I may steal that. Nice to see you in our comments, Doug! Average blog post today takes me at least a week to write, and I try to average 300-500 words a day. Super interesting article, Andy. Would love to be able to respond to it next year. I was curious about the promotion portion of the survey. Maybe it’s just me, but SEO as a promotional tactic seemed a bit vague/broad compared to other tactics, like email, social, and paid media. I imagine some people simply fill in information in a plugin like Yoast SEO and consider that sufficient, whereas others may consider SEO to be link building and embedding video or multiple images. Did you get that impression as well? Great article; one of the best and most detailed valuable information I have read for quite a while. Thank you! 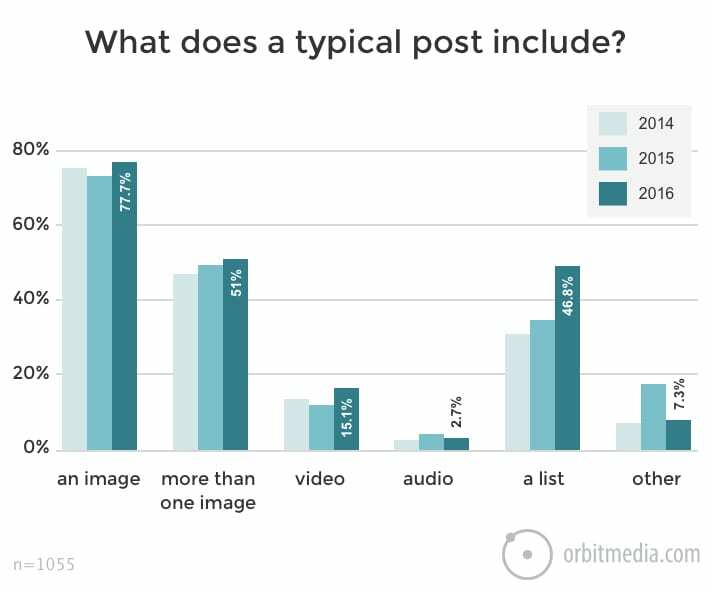 Interesting that including audio in posts is flat at only 15%, but it ranks highly in terms of its value for getting results. That’s good enough for me. That’s an interesting/important observation, Jeff. What people do and what works don’t really align that well, do they! Kudos to you and your team on this work Andy! Great stuff! very useful information. Thank you ! I was wondering if you have any insights on how these trends differ between B2B and B2C bloggers – especially B2B tech. Thanks again and keep up the great work ! You also made me very curious. So I wanted to give some data back to you. You deserved it. My last 2 radio columns (scripted for me based on my input – which took me 30 minutes to write) were recorded each in 3-4 minutes. Each. The columns were 600 and 800 words. I am now testing voice to text for my blogs posts. My goal is to go back from 5-7 hours writing to 3-5 minutes recording. Research will stay around 3 hours. Your insights might have saved me 4 hours per post!! Aka 50% less time, or 100% increase in post frequency! Whatever it will be…. Interesting enough. And hopeful, if you ask me. But I am not sure how strong the results really are. Do I understand correctly all the data is gathered by self reporting participants? No checking of facts? Were the participants readers of your blog – hence a self selecting group? I am really not sure what to make of it. The one comment of all of the hot shots you quote that I think is right on target is the one by Joanna Wiebe. Let’s hope not everyone is going to churn out 1000+ words articles just because it seems to be the winning trend. And not lists posts either, thank you, Jay Bear. Terrific analysis and comparison. I would like to see what type of bloggers are represented by this data. Do they come from SMEs, agencies? Are they copywriters or enterprise marketers, or are they independent journalists and mum bloggers? This would be helpful to know. I would also love to see a stat somewhere in the universe that shows how many bloggers there are now compared to 2010, 11, 12 etc globally. Not sure this is possible, but that’s the stat I’m after. I agree that longer, more considered posts are more effective. I’ve certainly found that to be the case with my own blogs but the take on audio doesn’t resonate. Thank you for doing this research. I’m curious whether average time writing includes research and editing for most writers? I can certainly spend a lot more time on those steps than the actual writing process.